Two guest DJ's this month. Firstly from Rob's Records in Nottingham ROB SMITH who will undoubtedly be bringing a sales box along with him. So bring some spare cash with you and have a browse. Secondly, Kevin (SHUTE) Johnston who's been around the scene for many years and knows what Northern Soul is all about. STAY OVER NIGHT IN THE FULLY REFURSHISHED ROOMS AT THE ROYAL HOTEL (home of The Box). Special Northern Soul reduced rates, £30 single, £40 double, £50 superking. Breakfast £9.50 extra. 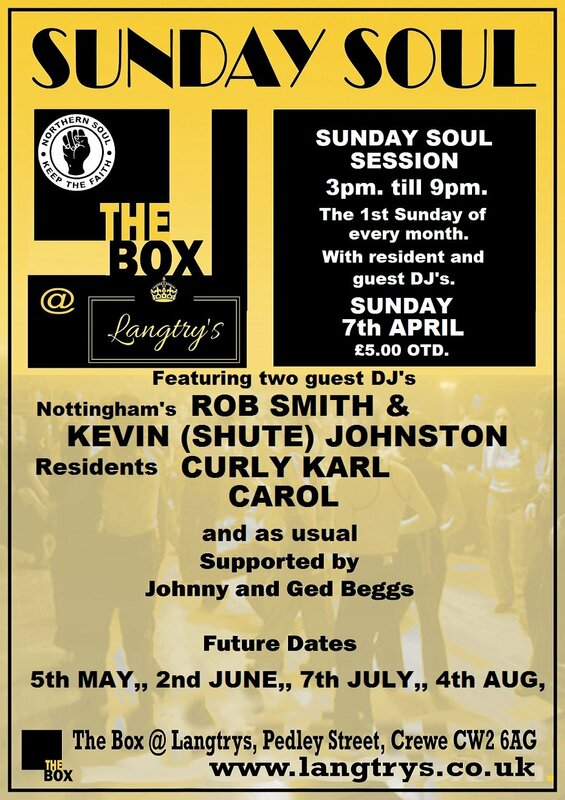 Booking by phone only 01270 257398, quoting Northern Soul for these special rates. Yet another top packed afternoon, great music great afternoon - see ya nxt month.